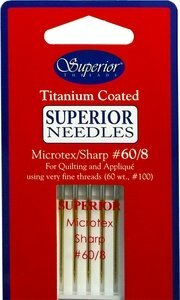 Introducing the next Superior Needle, Superior's Titanium-coated Microtex (sharp) #60/8 Needle for stippling, applique and detail quilting. We've taken the fantastic Microtex needle platform and added our signature layer of Titanium-nitride coating which extends the life of your needle 6-8 times.These needles are packaged in glassine envelopes for the first batch. Be one of the first in the world to try our Microtex needles!